From mild and mellow, to bold and spicy, garlic is a culinary treasure. Use it raw or cooked to add distinctive flavor. Softneck garlic grows in a variety of climates and does not require cold temperatures to grow, making it perfect for regions with mild winters although it also grows well in areas with cold winters. They have smaller cloves than hardneck varieties, store longer, and are ideal for braiding. Hardneck garlic has stronger, more complex flavors and they produce a tall edible flower stalk, called a "scape", in spring. 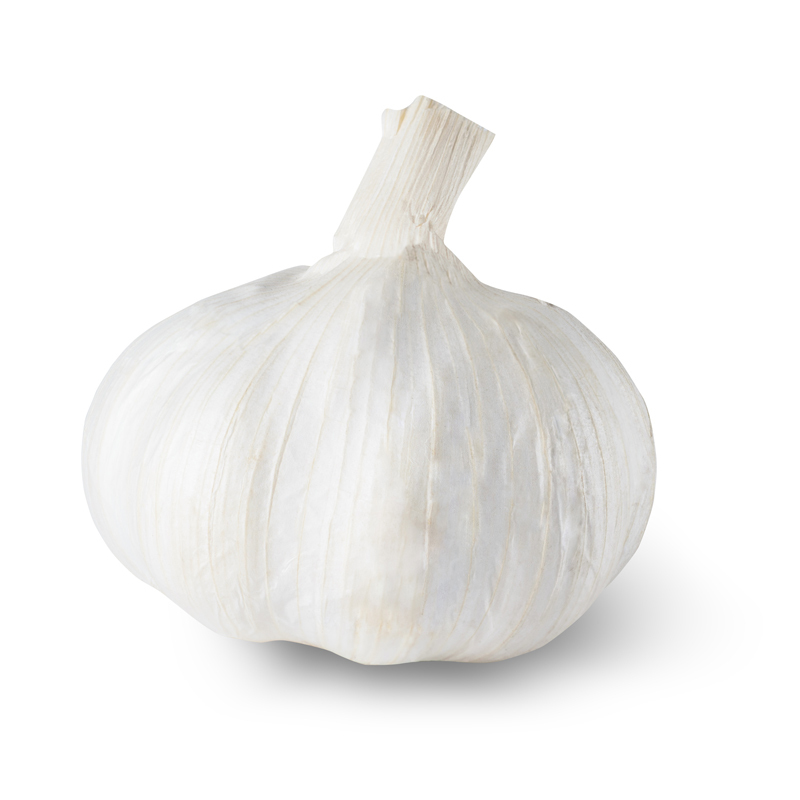 Hardneck garlic varieties generally can be stored for 4 to 6 months. 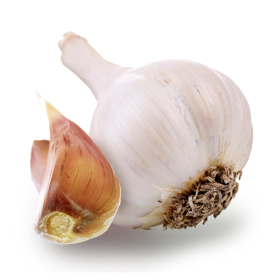 Hardneck garlic is not recommended for mild climates of the South where the winters aren't cold (a requirement for this type to bulb); however, pre-chilling bulbs helps to fulfill the cold requirements. Simply place the bulbs in a dark location at 40°F with a relative humidity of 80% for 40 to 45 days before planting. Family: Alliaceae (formerly Liliaceae) Allium or Onion family, includes onions, garlic, chives, shallots, and leeks. When to plant outside: Garlic is planted in fall for harvest 7 to 9 months later (midsummer). In cold climates, sow individual cloves from mid-September to mid-November. Garlic is frost-hardy, but ideally should be planted 4 to 6 weeks before the ground freezes to give the bulbs time to establish roots. In mild climates, garlic can be planted until January. Wait to divide individual cloves until planting, and leave the papery skin intact as much as possible. Plant garlic 2"–3" deep with the pointed side up, 6"–8" apart. Rich, well-drained, and amended with well-rotted compost. Soil pH range of 6.0-7.0 (average for growing most vegetables). Keep moist but not soggy. Decrease water as harvest nears to prevent decay of outside layers or "wrappers." In wet climates or poorly drained soils, grow in a raised bed to increase drainage. In areas where the soil does not freeze, or the soil thaws during the winter, keep soil moderately moist. Full sun is ideal but they will also grow in part shade. In spring after shoots emerge, apply a high nitrogen fertilizer, such as fish emulsion or blood meal. Apply again about 2 to 3 weeks later. Remove weeds regularly to reduce competition for water and nutrients. In spring, hardneck garlic will produce a tall stem with a curlicue at the top and a swollen flower bud at the end. This flower stalk, called a "scape", should be removed to keep the plant's energy focused on bulb growth. Scapes can be eaten, and have a milder flavor than the garlic cloves. On occasion, softneck garlic can also produce a scape due to drought or cold stress, the scape should also be removed in this case. After planting, apply 2"-4" of mulch (e.g., straw, untreated grass clippings, shredded leaves) to maintain moisture, insulate the cloves and any green shoots that sprout through the winter, and help prevent frost heave. Loosen mulch in spring to allow shoots to push through thick or compacted mulch. In very cold climates, remove mulch after the last hard freeze of later winter/spring to allow soil to warm. Reapply mulch after shoots emerge.